You could forgive Richard Taylor and Greg Broadmore for letting success go to their heads – even just a little. After all, the former has won five academy awards and co-founded the company responsible for the special effects on The Lord of the Rings, arguably the biggest fantasy films of all time, and the latter has recently burst onto the scene as the visionary designer behind the technical special effects for District Nine, one of the biggest science-fiction films of this year. However, the pair remain pleasantly down to earth and, whether by luck or a cunning charm offensive, Chengdu Grooves found the pair in a corner of Crowne Plaza’s restaurant flicking through a copy of last month’s magazine. Both were transfixed by a picture of the forty-foot dinosaur that inhabits the Zigong Natural History Museum. “I’ve read about China’s massive dinosaurs”, Broadmore quipped, rasping his enormous beard with his thumb, “that must be a Seismosaurus I reckon”. 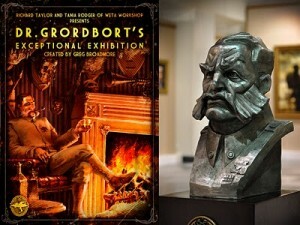 Taylor and Broadmore remained equally enthusiastic about a range of subjects during the interview, and it’s clear that the two are kindred creative spirits who, despite enjoying more success than most of their fellow peers could dream of, are still interested and inspired by the world around them. Taylor is best known as director of Weta Workshop, the special effects company who designed and produced all the weapons, armour, creatures, makeup, and miniature models for The Lord of the Rings trilogy of films. 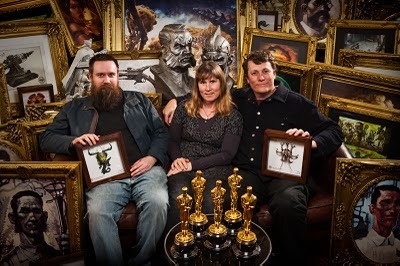 Taylor co-founded Weta in 1994 with his partner Tania Rodger and celebrated Kiwi director Peter Jackson, with the primary aim of supplying special effects to the burgeoning New Zealand film industry. Their first major jobs included producing the special effects for film and TV including Heavenly Creatures, Xena, and The Frighteners. This then led them to work alongside Jackson on The Lord of the Rings film trilogy, for which they won four academy awards, later adding another for their work on Jackson’s adaptation of King Kong. “The designs for District Nine needed to come together really quickly”, added Broadmore, “and that was good in a way, to focus the mind a bit. I’m just delighted with how it’s been received”. Around half the exhibition features Broadmore’s fictional universe of Dr Grordbort, which started as a collection of ray-guns (a passion of the sci-fi-obsessed artist since childhood), then coalesced, gained layers and came together into a more complete collection. As the pair brought over the exhibits, they did so in the knowledge that the Chinese general public were not necessarily going to know about the world of Dr Grordbort, and so realised the exhibition needed something that would bear relation to their film-watching experiences. With this in mind, they brought along a collection of props from The Lord of the Rings, The Lion the Witch and the Wardrobe, Prince Caspian, King Kong, and a selection of other bits and pieces and that make up half of the exhibition. The other half features paintings and sculptures, props, models and artwork from Broadmore’s body of work. The exhibition also features five very special guests, whom Taylor introduces: “I’ve brought the Oscars, which is a very unusual thing to do because we never usually take them out of the workshop. However, Gavin (Crombie) was convinced that the Oscars would have some reference in people’s mind here to the film industry and to the international film-making community, so I figured if I’ve won them and I can raise money for the earthquake fund then I should bring them. I wrote to the academy, who are appropriately very strict on these things and they said of course, you should take them to try and raise awareness of the earthquake fund”. All proceeds from the exhibition will go towards helping the victims of last year’s earthquake here in Sichuan, which killed almost 70,000 people and left around five million more homeless. So what’s next on the horizon for the two artists who seemingly have the world at their feet? “Well, we have aspirations for things in our future but it’s an ever-changing and unique journey. No matter how well-planned you are, the vagaries of the world’s film and entertainment industry nudges you along a particular path, so we have to be accepting and intuitively understanding of that” said Taylor.